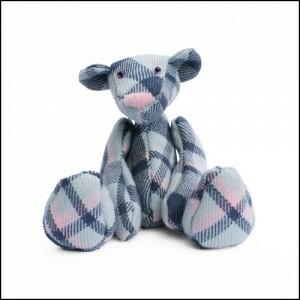 Donald is a bright 4″ sitting teddy bear handmade using specially selected 100% worsted wool. The yarn was hand dyed to a very specific colour palette before being woven in to a check design. Glass beads have been used to give him a weighty feel. He is fully jointed with five cotter pin joints, glass eyes and a hand stitched nose. Donald has now been adopted.